Wynstaithe01263 715779work01603 870304fax Self-cateringThis wonderful family holiday home has all that you would need for a great holiday. Based near the centre of Sheringham, but in a quiet spot, it is ideally located for beach days or exploring more of the north Norfolk coast. The house is set over 3 floors, so there is plenty of space and the private garden to the rear is a lovely spot for summer eating. A lockable garden gate ensures secure bike storage, if you are planning some of your holiday on two wheels. Sheringham is a great base and offers the visitor entertainment all year round and the Coast Hopper bus will take you along the rest of the coast from Cromer to Hunstanton, much of which is a designated Area of Outstanding Natural Beauty. • Notes: The top tier of the garden has a small pond, but is not accessible to guests. Wynstaithe offers weekly bookings starting on Friday. This wonderful family holiday home has all that you would need for a great holiday. 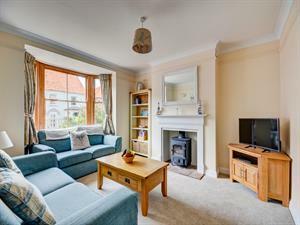 Based near the centre of Sheringham, but in a quiet spot, it is ideally located for beach days or exploring more of the north Norfolk coast. The house is set over 3 floors, so there is plenty of space and the private garden to the rear is a lovely spot for summer eating. A lockable garden gate ensures secure bike storage, if you are planning some of your holiday on two wheels. Sheringham is a great base and offers the visitor entertainment all year round and the Coast Hopper bus will take you along the rest of the coast from Cromer to Hunstanton, much of which is a designated Area of Outstanding Natural Beauty.